Since 2004, BEM Heating and Cooling has been honest, reliable, and enthusiastically on the cutting edge of the HVAC industry’s technology to better serve families on Long Island. We were approached to rebrand the company and design their first website to emphasize the high level of quality and expertise and services that BEM provides. BEM’s brand identity was inspired by the heating, cooling & HVAC services that they offer. The ‘E’ in BEM was stylized into 3 parallel waves each with a unique color and purpose. Blue for cooling, orange for heating, and green for energy efficiency services. BEM's high level of expertise and services is best for homeowners that appreciate the value of a quality installation, and cost-savings in the long run when hiring a highly experienced company to do the job properly. The new website needed to differentiate BEM from others in the HVAC industry, and attract those that appreciate a highly customized and detailed approach to services and installations provided. 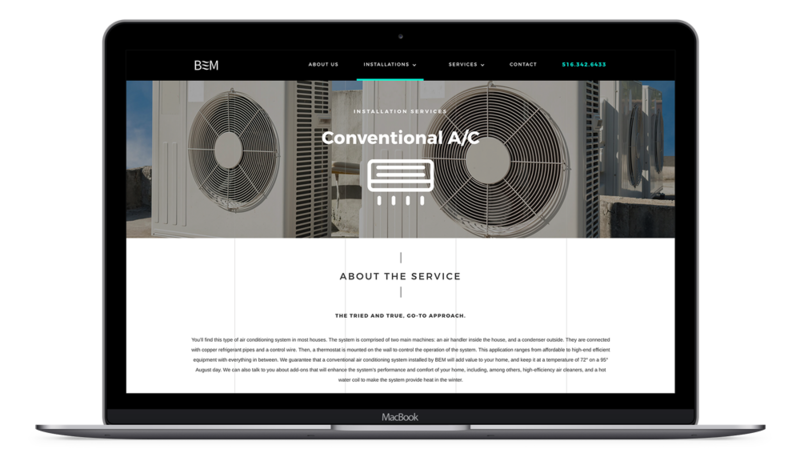 The website makes use of modern interactions and micro-interactions to not only set BEM apart from its competitors, but to also showcase a company that is advanced, cutting-edge and is revolutionizing the heating and cooling industry. The vertical lines growing from top to bottom are inspired by the textural qualities of A/C vents and steam grates. The overall experience is bold yet minimal, giving the user a visual balance of interactions, imagery, and text. An electric turquoise color accents the website to draw the users eyes to important information and CTAs. While heating and cooling needs might be for our homes, researching the right professional company to help you can happen from anywhere. 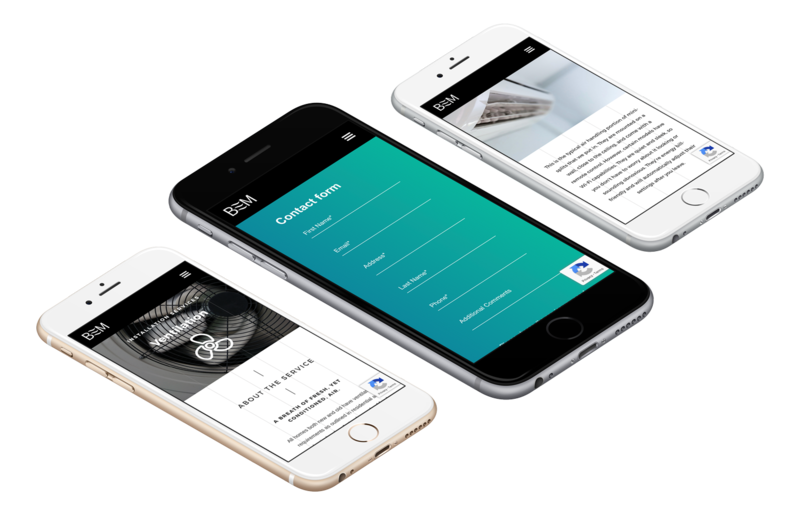 It was crucial for the BEM website to deliver a strong of a first impression to mobile users, and set themselves apart from competitors. We are excited to have partnered with a brand that takes a customized and modern approach to their work in the HVAC industry. We feel proud to have fueled BEM's continuous growth with a fresh logo and first ever website to compliment this cutting edge brand to continue to propel them forward.